Check out the new Sheboygan County Humane Society Pet of the Week! Sergeant Major is 9 years young, and has been here at the shelter for more than 70 days. 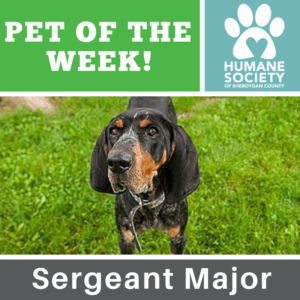 Sergeant is a man of simple pleasures and enjoys activities such as tracking down the neighborhood varmints with his keen sense of smell, and just enjoying time in the great outdoors! Find out more about Sergeant Major here.